— Traditional beginning of a story, used as a Tale-chaser mantra. Bards are famed for their story-telling, and always value a good new story. Loremasters and Archivists will go to great lengths to uncover hidden myths and legends. But for the lover of stories, both in their reading and in their telling, there is only one true path: the way of the Tale-chaser. Tale-chasers do exactly that, they travel the world to find new stories - and then become stories themselves. Using the powers of myth and legend, Tale-chasers become both loremasters and storytellers, and there are none for whom a well-told story is more powerful. Tale-chasers are, at their core, lovers of stories, and anyone who wishes to become one must have already shown this love by their wide reading of even trivial facts. Tale-chasers must also be somewhat familiar with magical methods, though many different disciplines of magical study or talent may qualify for Tale-chaser. Bardic Knowledge or Lore class feature. Collector of Stories skill trick. Ability to make trained checks in Knowledge (Arcana, Dungeoneering, History, Local, Nobility, Religion, and the Planes). Perform (any that may be used to tell a story), 8 ranks. Must have read a legend such that a Tale-chaser could gain benefit from it (see Myth Binding, below). (4+Int/Lv.) Class Skills: Bluff (Cha), Concentration (Con), Craft (Int), Decipher Script (Int), Gather Information (Cha), Knowledge (all skills, taken individually) (Int), Perform (Cha), Profession (Wis), Search (Int), Speak Language (N/A), and Spellcraft (Int). A Tale-chaser gains no new proficiency in any weapons or armor. When a new Tale-chaser level is gained, the character gains new spells per day (and spells known, if applicable) as if he had also gained a level in a spellcasting class he belonged to before he added the prestige class. He does not, however, gain any other benefit a character of that class would have gained. This essentially means that he adds the level of Tale-chaser to the level of some other spellcasting class the character has, then determines spells per day, spells known, and caster level accordingly. If a Tale-chaser has more than one spellcasting class, he must decide to which class he adds each level of Tale-chaser for the purpose of determining his spellcasting ability. A Tale-chaser may use the following spell-like abilities at will, with a Caster Level equal to his own: Amanuensis (plus the ability to copy nonmagical pictures, diagrams, and illustrations), Comprehend Languages (but with a duration of Concentration), and Scholar's Touch. Also as an at-will spell-like ability, a Tale-chaser may cause a willing target's words to be immediately copied to a page or book; the Tale-chaser must be able to both hear and understand the speaker to use this ability, and must be holding or touching the book or page. If the target makes a high Perform check, the text may even have illustrations or diagrams as appropriate for the story told. This effect lasts for as long as the Tale-chaser maintains Concentration, continues to touch the book or page, and continues to be able to hear the speaker. The speaker may end the effect at any time. The created text is nonmagical, and this spell-like ability lacks the ability to capture even the verbal components of a spell cast with sufficient precision that someone could learn the spell from it, though someone might use Spellcraft to identify what spell it was as if they had seen it themselves. 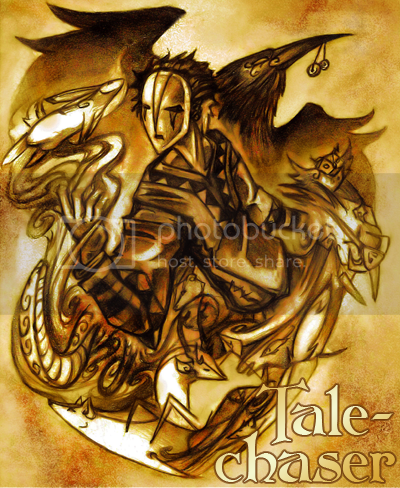 Tale-chaser levels stack with any existing levels for the purpose of Bardic Knowledge or Lore checks. A Tale-chaser with levels in Archivist may also add half his Tale-chaser levels for the purpose of determining his Dark Knowledge abilities (but not uses per day). At 2nd level, a Tale-chaser gains their signature ability: the power to draw upon the stories and legends they have read as a source of real power. This is mechanically similar to the Binder's Soul Binding class feature, with a few key differences. First, in order to use Myth Binding, a Tale-chaser must have a written copy of a story in which the legend he will emulate uses the abilities he will gain. Such stories are found everywhere, but not all stories are of sufficient mythical importance to actually grant a Tale-chaser any abilities. Finding a suitable story is as much about luck as it is about skill. In a well-stocked library, a Tale-chaser could use his Scholar's Touch spell-like ability to search 600 books per hour, but most libraries aren't going to have the kind of book that a Tale-chaser is looking for. More often, a Tale-chaser has to seek out someone who can tell the story. If searching a library, the Tale-chaser makes a Lore check; if seeking for a storyteller, he makes a Gather Information check. In either case, this process takes 2d4+2 hours, and the Tale-chaser has a chance to find a legend for whom 15 + the legend's "binding" DC is less than the check made. Which suitable legend the Tale-chaser finds is selected by the DM (or at random), but a Tale-chaser's chance of finding any legend at all is only 20%, regardless of their check. Some locations may simply not have any (new) stories available at the time; a check result of at least 25 is sufficient to reveal this fact if it is the case. In some cases, new stories may be very obvious, in which case a check is unnecessary. Examples might include a special ceremony in which a tribal shaman tells a great story of his people, or a long lost tome found in a dragon's horde. A Tale-chaser can always tell by using Scholar's Touch whether or not a story is worth reading; for an oral story, however, he must listen to it before he can make that judgment. Sometimes particularly important stories may be so memorable that a Tale-chaser is able to transcribe it after the fact from memory well enough to gain its benefit; when this is the case is always the DM's judgment, however. Most Tale-chasers will keep a book (often a Wizard's spellbook) in which to copy down stories from several separate sources, in order to cut down on the number of books they need to carry; legends require a number of pages in a spellbook equal to their "binding" DC (see below). Most Vestiges exist in legend form, and a Tale-chaser may use them as-is, but additional tales or legends may be appropriate; creating a new legend is mostly identical to creating a new Vestige - see Designing Your Own Vestige on Wizards' site for pretty detailed advice on doing that. Second, the process of Myth Binding is different from Pact Making: Tale-chasers rarely, if ever, make actual contact with the subject of their stories, and a story need not even be true for the Tale-chaser to gain the benefit. Instead of drawing a seal and negotiating a Pact, Tale-chasers must simply read the story (typically requiring an hour of leisure in which to do so; even with short stories, Tale-chasers imagine themselves in the legend's role, and their daydreams can make a story much longer than its actual text), and then get 8 hours of sleep; upon waking, they will have the abilities that the story grants for the next 24 hours. The abilities granted are mechanically identical to the abilities granted by Vestiges, though depending on the story they may follow the rules of the Binder or the rules of the Pact Mage (i.e. suffer from Arcane Spell Failure, be subject to disruption, and provoke Attacks of Opportunity). Tale-chasers make the equivalent of a "binding check" (using 1d20 + their effective binding level + their Charisma modifier) against the legend's "binding" DC, and may feel the influence of that story on their mind, even taking the usual penalties for breaking it, but this is entirely internalized, not the result of any creature's influence on their soul. Tale-chaser legends don't have a "sign" the way Vestiges do; even if a legend is about a Vestige and grants the same abilities, the Tale-chaser would not show the Vestige's sign. Third, 2nd-level Tale-chasers may only gain the abilities from a single legend in a given day, and may only gain the benefit of a second legend per day at 10th level. Fourth, Tale-chasers use their Caster Level as their Effective Binding Level for determining the highest level legend they can gain abilities from, and for the efficacy of those abilities. The highest level legend they can gain benefit from is listed below in Table 2 - Maximum Legend Level, but for the purpose of determining the highest level legend, their Caster Level cannot exceed twice their class level (the Improved Binding feat may increase his Effective Binding Level for this purpose, even beyond twice his class level). These levels are equivalent to Vestiges' levels. When a level is marked with an asterisk (*), legends of that level only grant one ability, akin to the Bind Vestige feat. Levels marked with a dagger (†) grant only two abilities, as with Bind Vestige and Practiced Binding. In both cases, legends of a level lower than the marked level may be used in full, as with the Soul Binding class feature. Myth Binding may be used in place of Soul Binding for any prerequisite for a feat, prestige class, or other feature, but only if the Tale-chaser knows of the feature or class: for example, in order to enter the Scion of Dantalion prestige class, a Tale-chaser must know a story about a Scion of Dantalion. For classes, this usually requires a Knowledge check as defined in that class's Lore entry. For most feats, the knowledge is usually pretty intuitive and therefore no check is necessary, but in some cases a DM may require that a Tale-chaser do something more (such as make a Knowledge or Lore check, or investigate the matter) in order to gain the feat. Tale-chasers are strongly advised to check with their DMs before planning on any feature that requires Soul Binding. Feats that improve aspects of binding or pact-making instead make analogous improvements to Myth Binding: Favored Vestige becomes Favored Story and allows a Tale-chaser to apply its benefits to a legend he's read or heard, Rapid Pact-making becomes Rapid Reading and allows a new story to be read and the benefits thereof to be gained in just a Full-Round Action, etc. As a special mention, Improved "Binding" allows a Tale-chaser to increase his effective binding level for the purpose of the highest level legend he can gain benefit from by +2, even above twice his class level (his new maximum would be twice his class level +2). Any Prestige Class that advances Soul Binding may instead advance Myth Binding, as if a Tale-chaser had gained another level of Tale-chaser for the purposes of his effective binding level and how many tales he can gain abilities from in one day. A 3rd-level Tale-chaser gains a +2 synergy bonus to Bluff, from his ranks in Perform. Further, a Tale-chaser with 5 ranks in Bluff gains a +2 synergy bonus to any Perform check used to tell a story. As a Standard Action, a 4th-level Tale-chaser may share any bonuses he has from Knowledge Devotion with anyone who can hear and understand him. A Tale-chaser may attempt a Bluff check to hide this information from his enemies, if, for example, he does not want to reveal an ally's weaknesses to an enemy who is the same creature as the ally. When a 5th-level Tale-chaser tells a story, all creatures who can hear it and are not completely mindless understand it. Whenever he uses Perform to tell a story and makes a check of at least 20, all who hear it, even those who do not know the language, or even have no language at all, nonetheless understand the story completely, both in factual content and emotional message. This story lingers in their mind, and in order to completely forget about it they must consciously make a Will save equal to the story's Perform check. By the same token, anyone specifically telling a story (using any Perform skill) is always understood by the Tale-chaser, even if the Tale-chaser does not know the language in question, or the story lacks language altogether. This does not allow him to understand any language; the Tale-chaser is merely picking up on the essence of the story itself, and understanding that. A Tale-chaser's skill in this regard is so complete that he understands all factual content and emotional nuance of the story, no matter how subtle or specific to the culture of the speaker. A Tale-chaser only misses the meaning of a story if he completely lacks the senses required to perceive it (for example, were an Illithid to tell a story to its brethren using their telepathy, a Tale-chaser without telepathy who witnesses it would still not know what was going on, though he might pick up on the fact that a story is being told by the Illithids' gestures). At 6th level, a Tale-chaser has become so comfortable with stories and eldritch tomes that even cursed or ensorcelled texts are harmless to him. A Tale-chaser cannot be directly harmed by learning anything (such as forbidden lore that might drive others mad) or set off magical traps that require reading (such as Explosive Runes). He may still be injured by such traps if someone else sets them off, however. Stories themselves can be sensed by a 7th-level Tale-chaser. If he passes within a mile of a powerful story (such that it might be used to gain abilities, or is otherwise important) that he does not know, he is aware of the story's existence, though not its location. This includes both written stories and stories that exist only in the minds of creatures within that radius, though he is not able to distinguish between the two. Moreover, a Tale-chaser gains the Mind-Affecting ability to sense powerful stories within 60 ft. of himself, able to pin-point the story's location. This sense is detailed enough to identify a creature who knows such a story, and attack it without miss chance, even if it is invisible or well-hidden. A creature aware of the power of the story they hold may suppress it enough that this ability does not function, however. Creatures that have been told a story by someone using The Story Must Be Told and are carrying that story with them are also sensed, and the Tale-chaser can further understand that story as if they had been there themselves to hear it, provided he concentrates on the creature for as long as it took to hear the first time. A creature that the Tale-chaser is concentrating on will experience vivid memories of the story, which he may suppress if he consciously wills it, preventing the story from being told to the Tale-chaser. If the the Tale-chaser was actually present for the telling, he instead immediately identifies the performance and also understands any distinctions in nuance between what was said and what the creature understood (though such distinctions are almost always minimal due to the way The Story Must Be Told works). A Tale-chaser of 8th level or higher can once per day make a Suggestion (as the spell) to any number of creatures that are already listening to one of his stories. Using this ability does not break the Tale-chaser's performance as it relates to telling the story. A Will saving throw (DC 10 + class level + Charisma modifier) negates the effect; creatures who have already failed a save against any compulsion effect that forces them to listen to the story (such as a Bard/Tale-chaser who uses his Fascinate class feature) do not get a second save against this effect, however. Incite Passion is an Enchantment (Compulsion), Mind-Affecting, Language-Dependent (but see The Story Must Be Told) ability. A 9th-level Tale-chaser is fluent in all languages. This is effectively identical to the Tongues spell, except that it is innate, always in effect, and cannot be dispelled or suppressed, even by an Antimagic Field or Dead Magic Zone. The image is slightly adapted from The Storyteller by Rasha Al-Najjar. All credit to her for the image; used with permission. Woah. Love love love this class. Very well done, and I definitely want to play this. Bard is the obvious entry, since Perform is easy to get and Sublime Chord later is sweet. Still, Archivist is very tempting. I love how a 2 level dip is quite reasonable, but the class is powerful, flavorful, and awesome enough that you want to go the full 10 if you can. Great job! Update: added an image. Many thanks to Rasha for letting me use it.